Darjeeling: Gorkha Janmukti Morcha chief Bimal Gurung released an audio clip on Wednesday denying the role of his supporters in the gunfight that killed a police officer and stressed the need for a peaceful and democratic movement. 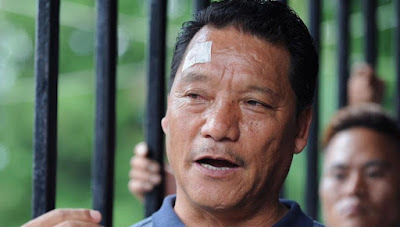 Gurung accused the Bengal government of hatching of "a conspiracy" to defame him and said the weapons that the police had claimed to have recovered from the site of the clash last week were from surrendered KLO activists. The police's claim that it was Gurung and his aides who had fired at the cops had alienated the Morcha chief further from the hill people and questioned his repeated stress on the need for a peaceful movement. #"I am telling you from my heart, all this is a conspiracy. These weapons are from surrendered KLO activists. A plan is being hatched to defame me, not allow me to come out in public. Even the death (of the police officer) is a planned conspiracy to frame me," Gurung said. "Had I indulged in an undemocratic movement, there would have been lot of bloodshed in the past 11 years.... In the present situation, everyone should maintain peace. Don't indulge in violence, we have to achieve Gorkhaland in a peaceful manner," he added. The Morcha leader seemed optimistic about the Centre's role. "Don't indulge in any violence, the Centre understands the situation and is trying to come up with a dialogue process. We must keep this in mind." Gurung's remark on the Centre's efforts to initiate tripartite talks is significant because the Bengal government is averse to including him in the dialogue process. After the murder charges against him, it is difficult for Gurung to be involved in any talks. The Morcha chief claimed that the state government had hatched the "conspiracy" of the clash because he wanted to come out in the public. In his audio clip on Wednesday, Gurung did not confirm if he would come out on October 30 but said he would "definitely do so". Told about Gurung's "conspiracy" claim, a senior police officer said: "He seems to smell conspiracy in everything as he is frustrated now." The chief judicial magistrate's court in Darjeeling issued a proclamation order on Wednesday in the name of Bimal Gurung, his wife Asha, Morcha general secretary Roshan Giri, Yuva Morcha president Prakash Gurung and party leaders Amrit Yonzon and Ashok Chhetri. The accused were also asked to surrender in court at 10.30am on November 23. Legal experts said the order had been issued under Sections 82 and 83 of the CrPC for proclamation and attachment of properties of those who were untraceable. The six were named in incidents of violence and arson in Darjeeling during the chief minister's visit on June 8. Gorkha Janmukti Morcha chief Bimal Gurung released an audio clip on Wednesday denying the role of his supporters in the gunfight that killed a police officer and stressed the need for a peaceful and democratic movement.